Welcome, welcome, welcome. If you do not know me, my name is Rebeka Stowe. I am a native Kansan living on the East Coast. I am currently living in New Jersey, training, coaching, and creating coffee. I am on a running Journey and would love for you to join. Give my page a look, and feel free to contact me directly! Be well. Training hurdles: Self-doubt, anxiety, and emotional variance are area's of my life requiring continual intentional work. Pursuing a more 'stoic' lifestyle day to day. Favorite foods: Coffee, Chocolate, Smooties. Hobbies: Being outdoors. Discovering. Wondering. Favorite place to compete: Stanford, Palo Alto, CA. Warm up song: It varies. Chill worship music to bring peace, then something that makes me happy. Follow on Spotify to hear what I hear. Why join this journey and choose to support me? I welcome you to observe and interact with me to find this answer yourself. A native Kansan, Rebeka attended Olathe Northwest High School where she first caught the eye of University of Kansas coach Doug Clark. Though she grew up among Wildcats, she took the opportunity to join the Jayhawks and never looked back. While at Kansas Stowe completed her BS in Health & Physical Education, earning many Big XII honors and three All-American awards while competing for the Cross Country & Track teams. Following her tenure at KU, Rebeka packed her bags and headed for the east coast, and after three years of running with the New Jersey New York Track Club, she now trains at Princeton University under Jason Vigilante. All this, and it almost never happened, as Rebeka shared that, "Going into High School I wanted to play Volleyball, and my mom told me I must run one season of Cross Country to give it a try. I did not enjoy running as much as I enjoyed my other sports, Soccer, Basketball & Volleyball. Thank God for my mother. It turns out what I enjoyed about those sports was the running. I just did not realize it until many years later." Off the track, Rebeka works as a coach and barista (serving up delightful creations at OQ Coffee). She enjoys new experiences, meeting new people, listening to music, and reading a good book over a cup of coffee. Running has been used as the vehicle and catalyst for growth in her life, she says, "It has taken me places, physically, emotionally, and spiritually that I may not have gone without the desire of my heart to excel and do well by her running. My philosophic approach to running is that it is holistic therapy, a means to gain greater wellness and joy in day to day life." When her athletic career is over, Rebeka plans to continue coaching. 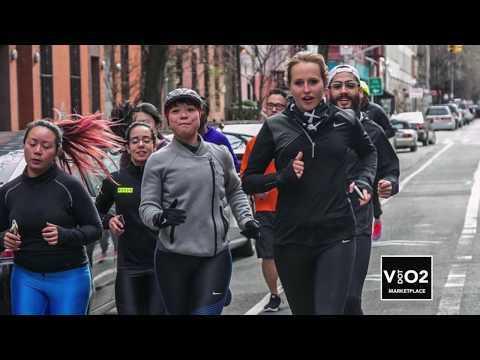 She is currently coaching at The Wilberforce School and with Nike+ Run Club in New York City, saying, "I would love to continue on this path, sharing my love for and learnings of the sport with others."